Our trip was triggered by a brochure from the Cambridge Alumni dropping through the door, as it does every year. Although the trips on offer are always very tempting, they are mostly too long in duration, too expensive, or to somewhere I would find too hot these days! What a fussy person! But last year's brochure did start with a tempter -a trip to see the Northern Lights travelling on one of the magnificent Norwegian Coastal Voyage vessels, in fact on my favourite one - the MS Trollfjord. Too good an opportunity to miss, as I had always wanted to experience the short Winter nights of northern regions! 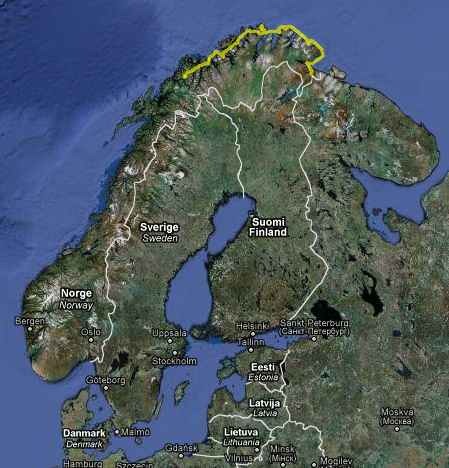 Essentially the trip was from Tromsø going east and north to the Russian border at Kirkenes and back again, with three nights on the ship and a couple of nights in Tromsø at the end. You can see the outbound journey plotted as a yellow track on the map at the left. There is an interactive map here, with the full outbound track as measured by my GPS, which worked well on board the ship placed near the cabin porthole. I feel it best to present the voyage in a chronological order, with the incidental activities and shore excursions in the order they happened. The Northern Lights deserve a section of their own, as a recurring theme throughout the trip. You will find a little more description with the individual photos. Here is the full slide-show - like the Aurora, best viewed with the lights dimmed. Having experienced the possibility of delays at this time of year (remember the snow last year and the high winds two years ago?) we decided to travel from Edinburgh to London Heathrow the day before. Actually, with an 07:30 flight it would have been impossible to do otherwise! Overnight at Heathrow hotel. Valentine's day! Early morning flight from London Heathrow to Oslo, and then on to Tromsø, arriving in the middle of a snow-storm. Hammerfest early in the morning. First ship crossing - MS Richard With. Honningsvåg - the excursion to the North Cape. We are visited by King Crab fishermen. Arrive at our half way point - Kirkenes. Kirkenes - visit to the Snow Hotel. Hammerfest - Melkøya gas terminal. Hammerfest - excursion to the Energy House. Øksfjord - not to be confused with Cambridge! Late night arrival at Tromsø. Tromsø - morning Husky Dog Sled excursion. Afternoon strolling round Tromsø, and visiting an older Hurtigruten ship - the MS Vesterålen with its rather quaint Panorama Lounge conversion. Afternoon travel from Tromsø to Oslo, and hence to London Heathrow. Overnight at Heathrow hotel. Travel from London Heathrow back to Edinburgh. Here are a couple of videos - captured with the Nikon D5000 DSLR and a 35mm f/1.8 lens. The ISO was set to 3200, and the video contrast increased to 200% making the effective ISO 6400. Hence the grain (noise) in the image. The camera was hand held, hence the image moving a lot more than I would like! The only purpose of these videos is to show how rapidly the Lights can change. The videos are in DivX format, and if your computer doesn't support DivX yet, there is a free player for Windows or the Mac here. Both videos are 1.4MB, so a quick download. Right-click the video and use the Save Link As or equivalent command for your Web browser to copy the files to your PC, so that you can play the movies as often as you want. I recommend the KM Player (current download) (for PCs) or the VLC Media Player (PC, Mac, Linux and more) to play the file, as the DivX player seems to play incorrect sound (sigh).